This is a family recipe that doesn’t use measurements. It’s strictly an as you like it sort of dish. I like bacon so I use a lot of it. Chop the bacon into bite size pieces and brown in the skillet. When browned to your satisfaction drain it on paper towels while you saute the green peppers and onions. Again you can chop as many or as few peppers and onions as you like but I like a nice, rich hearty soup so I use one big onion and two or three nice green peppers, chopped roughly the same bite-size pieces. saute until translucent. Take them out of the skillet and drain off the excess grease. Then add the peppers, onions, and bacon back to the skillet. Pour a quart of tomato juice into the skillet and put another quart of tomatoes in a blender to liquefy them. This makes a thicker juice than just using juice alone. 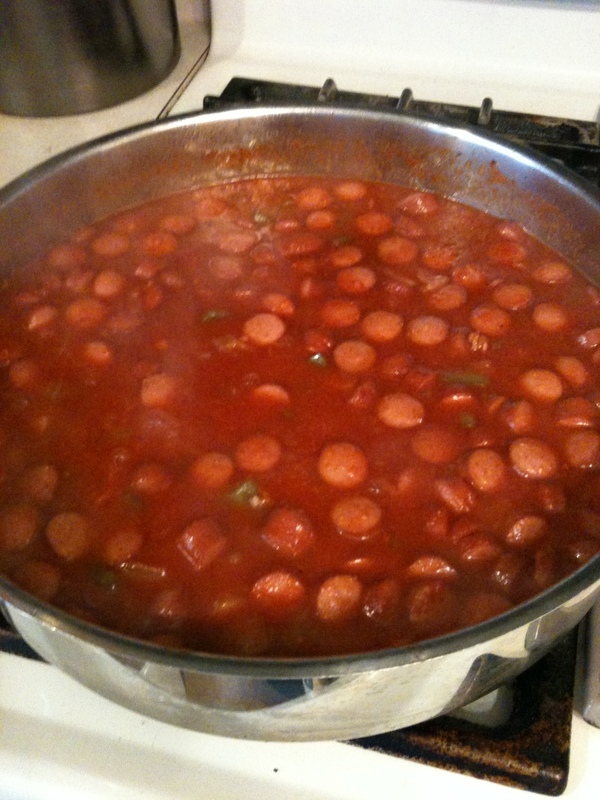 Chop up a package of good quality hot dogs and add them to the skillet and then let it simmer until done. For seasoning, I add salt, pepper, sweet paprika and crushed cloves of garlic. Because I find tomatoes acidic toward the last ten or fifteen minutes of cooking I sweeten with a little honey. This is a rich, thick soup and it’s good served with a good loaf of bread. Enjoy.